Talk given by La’Ron Williams at the Poor Peoples’ Campaign Moral Fusion Summit: Challening the Racial-Economic Caste System in Washtenaw County. What makes us a nation?. . .
We have no official national language . . . We don’t share a single religion . . . We aren’t of a single culture or “race” . . . What we are at this point is a group of people poised on the edge of having to make a hard choice. A nation is an idea . . . an idea . . . and the way that we move from this point forward will be the manifestation of the idea that we collectively decide to strive for …. the collective idea that we declare. 1. In the colonies that would become the United States, it was the first documented case of different punishments being handed out on the basis of physical appearance/background. 2. It signaled the beginning of a practice that caught on like wildfire. Up until that time, it was common for indentured servants to rebel, and when they did, they did it together – They didn’t care what each other looked like. But that court ruling acted to drive a wedge between “Black” and “White” indentures. What was once a united front of people fighting to end their suffering under a commonly recognized enemy was shattered by a simple idea that had no basis in reality. It was a “divide and conquer” strategy – a tool – that worked so well it eventually was adopted by all of the colonies. By 1681, the word “White” was encoded into law as a racial identifier. I repeat, it was consciously used as a tool to divide one group of poor folks from another. It worked then and still works today – so well in fact, that it has been expanded to operate across all kinds of lines of difference: gender, skin color, body size, religion, country of origin, income, and so on and so on . . . In 1640, and for more than the next 300 years, the class status of that Black man, John Punch, and everybody who looked like him, including my own ancestors, was locked into the unfolding American social fabric. Our place was at the bottom – as slaves. Unable to hold political office, with no guarantees to education, and with no control over our own bodies, our class status was cemented to racial identity. When you hear the long term impact of growing up in poverty in this country that Professor McLoyd just spoke about, it is simply unacceptable that 25% of our youth are growing up in poverty. It’s simply monstrous and here I don’t mean to insult monsters! This has been going on far too long, and it’s something we are going to change. My name is Joe Summers, for over thirty years I’ve been the Pastor of the Episcopal Church of the Incarnation and a community activist. The first thing I want to say today is how grateful I am for your being here today. Your presence here is making a concrete difference in helping us figure out what should be the agenda for the Poor Peoples’ campaign as we strive to challenge the racial-economic caste here in Washtenaw county. We are in the bottom 8% of counties for income mobility so clearly we have work to do. What we are doing here today has been inspired by the Moral Monday movement in North Carolina where people came together around a diverse area of social concerns, had people from each area of concern agree on what should be the primary goals in that area, and then collectively commit themselves to working towards all these goals. Though they began with far fewer people than we have here today they can now mobilize up to 100,000 people at a time in North Carolina. That’s the kind of thing we are hoping to once again be able to do here in Michigan because we will need those kinds of mobilizations if we are going to be able to achieve the kinds of systemic changes that we are needing in this country, in Michigan, and in this county. I want to take a few moments to talk about a couple of the key concepts behind this strategy. 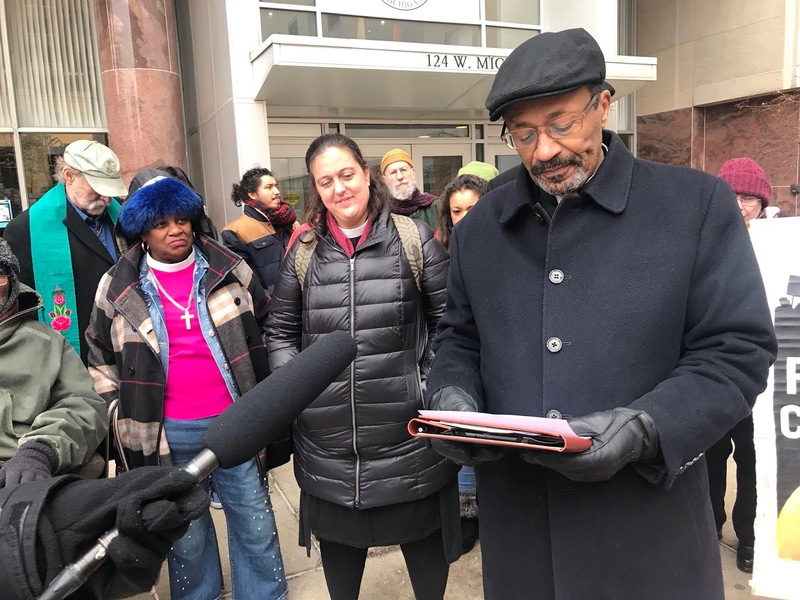 DETROIT – Activists are holding a press conference to discuss their legal victory and future action after a jury agreed their nonviolent protests against water shutoffs was justified in light of the harm caused by them. 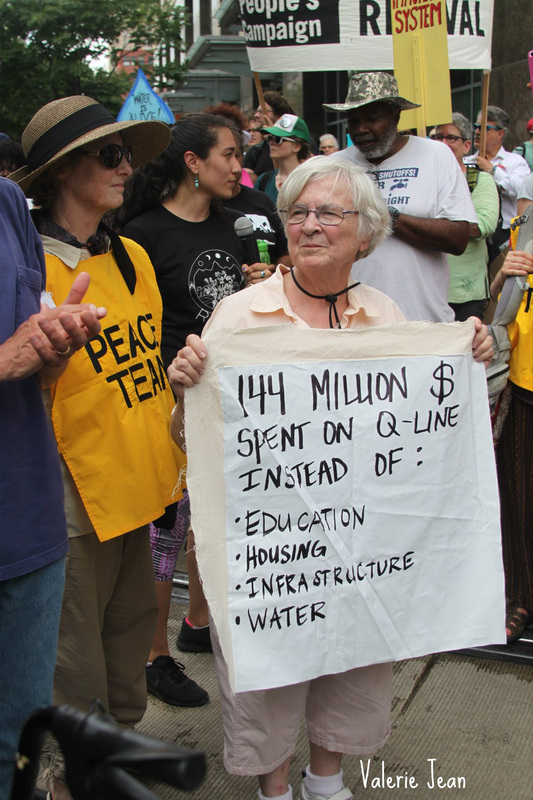 Last year, members of Michigan Poor People’s Campaign, dubbed the “Gilbert 7,” blocked the Q Line and the entrance to Quicken Loans to draw attention to the inequities of massive public subsidies for billionaires like Dan Gilbert versus massive water shutoffs for low-income Detroit families. Kimberly Vann, the forewoman of the jury that found two members of the group “not guilty,” will appear at the press conference to discuss her view of the case. A mistrial was declared on the other members of group, as the jury was deadlocked on a verdict. When: Tuesday, January 29, 3:00 p.m.
Just a note to update you on the latest with the #Gilbert7 trial in Detroit's 36th District Court. 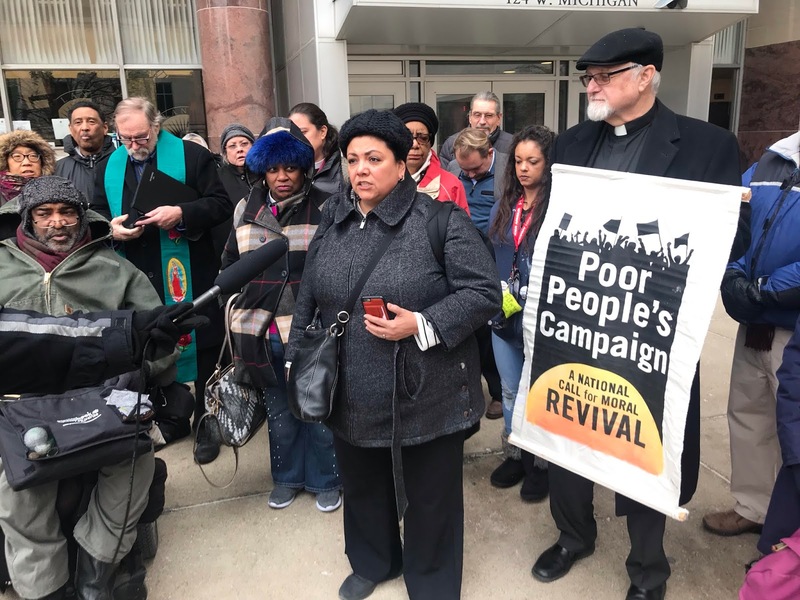 The jury reconvened for deliberations at 9:00 a.m. today in the effort to deliver a unanimous verdict in the case against the seven members of the MI Poor People's Campaign on trial for "obstructing a street care." After deliberating much of the day the judge adjourned the trial and jury deliberations at 2:30 p.m. closing the courthouse down due to the weather. The jury will begin deliberations again on Tuesday, January 29th at 9:00 a.m. toward determining a unanimous verdict of guilt or innocence. It is entirely possible that at some point Judge Larry Williams, Jr. will declare a mistrial, which might have multiple possible outcomes, including a decision by the Prosecutor's Office to pursue another trial against the seven defendants. Other possibilities include the prosecutor asking that the defendants plead no contest to the charges, or offer possible dismissal of charges under certain conditions. At this point we just don't know how things will go or how long the judge will continue to require the jury to deliberate. We will continue to keep you informed. Thank you for your continued support of the Gilbert 7 and the Poor People's Campaign. No matter the outcome of this trial, we will collectively continue to advocate with and on behalf of people impacted by poverty, racism, war, materialism and environmental devastation. 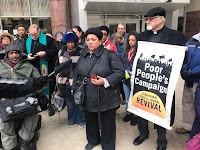 DETROIT – The “Gilbert 7” members of the Michigan Poor People’s Campaign and their supporters held a King Day press conference at St. Matthew and St. Joseph’s Church to talk about their nonviolent action, its connection to King Day and why, like King, they risked arrest. 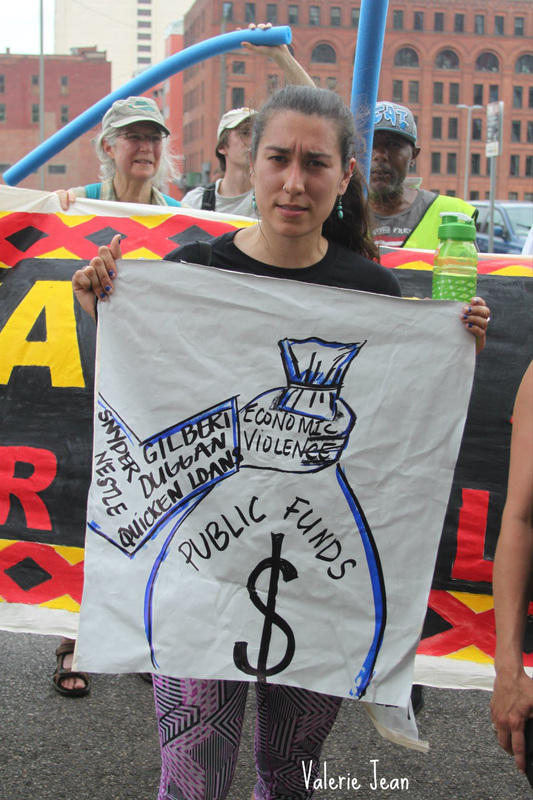 Last summer, they blocked the Q-Line and the entrance to Quicken Loans to call attention to the tens of millions in public money given to wealthy people like Gilbert even as Detroit families are forced to do without water because of high water bills. The seven defendants will appear in 36th District Court Tuesday before Judge Larry D. Williams, Jr. The activists also spoke out about a new report from the Haas Institute that cites work of Detroit activist groups such as We the People of Detroit to support income based water bills. “Martin Luther King Day is the perfect day to highlight nonviolent action taken for racial and economic justice,” said Marian Kramer of Michigan Welfare Rights Organization. “We are working to strike down racist policies such as billionaires like Gilbert getting massive tax subsidy handouts from a city that declared bankruptcy and is depriving thousands of mostly African American families access to water because their bills are too high. That sort of racism is cited in the Haas Institute report on Detroit’s water crisis. People are forced to do without water for drinking, cleaning and proper sanitation because of high water and sewerage bills and rates. That spreads serious disease as noted in Haas report which, calls for a Water Affordability Plan as Detroit’s water warriors have been doing so for years. 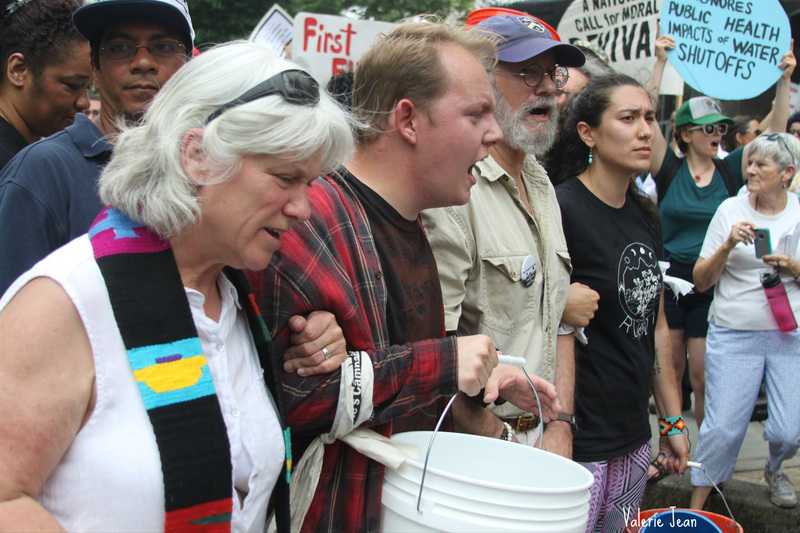 Activists with the Michigan Poor People’s Campaign have been granted a consolidated jury trial of charges that followed a June demonstration that ended with the arrest of 14 protesters. A Lansing judge granted the request on Jan. 15. The June 4 protest, which took place at the Michigan Department of Environmental Quality, was part of a national campaign titled “40 Days of Action” and carried out by state chapters of the Poor People’s Campaign across the U.S. At the Lansing protest, roughly 600 activists took part in actions to bring attention to the plight of fellow Michiganders who either lack clean water or have been denied water because of their inability to pay for it. The 14 activists who appeared in court on Tuesday were among approximately 30 who were originally arrested for either blocking the doors to the MDEQ building or blocking workers from exiting the building’s parking lot. The others, who for various reasons were unable to face the time and potential consequences of going to trial, have opted to participate in a diversion program. The Rev. 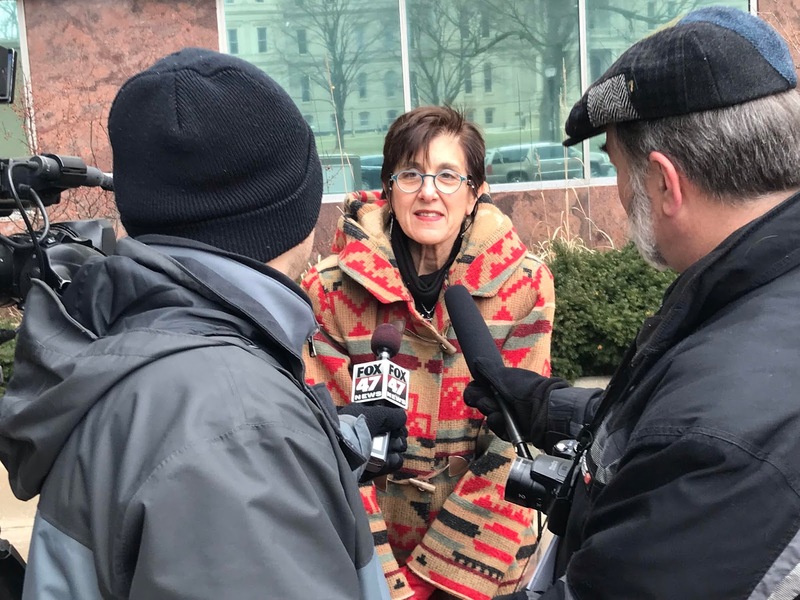 Dr. Liz Theoharis, one of the co-founders of the national Poor People’s Campaign, was in court on Tuesday to see if her case would be joined with the other activists’ in a single trial. 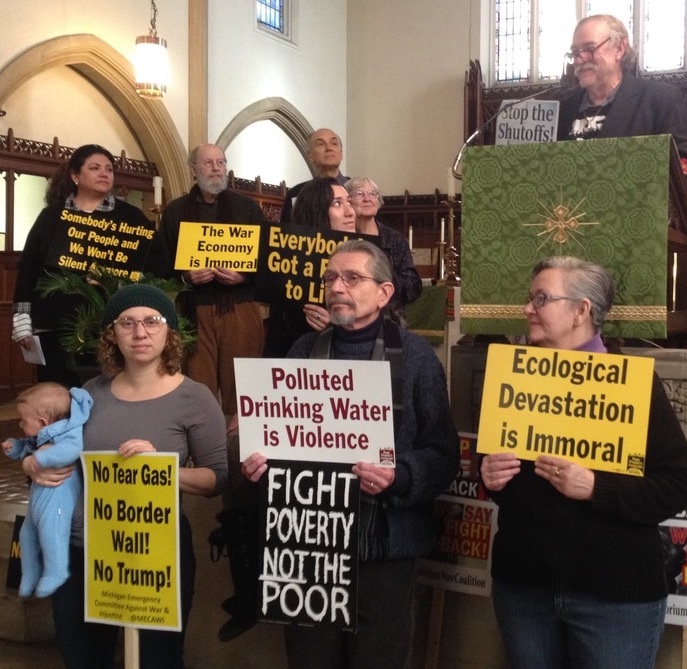 Theoharis said that she chose to be arrested—not just on June 4 in Michigan, but several times nationwide—because “nonviolent civil disobedience is what these times call for,” citing issues ranging from lead contamination and ongoing poverty to 15 million people in the U.S. being unable to afford water at all. As Daily Kos reported in September, as many as a quarter-million Detroit households alone were subjected to water shutoffs from 2014 to 2017 because of their inability to pay high bills. Dawn Wolfe is a freelance writer and journalist based in Ann Arbor, Michigan. This post was written and reported through our Daily Kos freelance program. LANSING – Before their day in court, members of the Michigan Poor People’s Campaign spoke out to demand clean, safe, affordable water for all and an end to racial bigotry at the root of the water shutoffs. Activists highlighted their demands months ago by blocking the entrances to the Michigan Department of Environmental Quality (MDEQ). They stand by this action despite having been arrested because of the harm massive water shutoffs cause families. 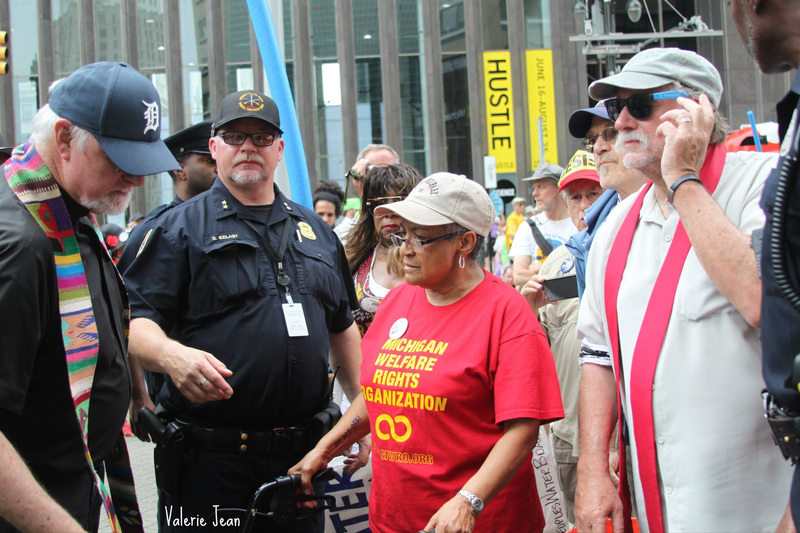 Thirty members of the Michigan Poor People’s Campaign took part in blocking entrances to the MDEQ, and about half were arrested. They are demanding a jury trial and spoke in front of Lansing 54A Court on West Michigan Avenue. We bring you new year's greetings and updates in 2019! During last summer's 40 Days of Action, there were 105 arrests at several Lansing and Detroit locations. These non-violent, moral fusion direct actions were in protest of unjust Michigan policies and leadership failures that harm poor and low income working people. On June 4th, thirty MI PPC activists were arrested at the MI Department of Environmental Quality (MDEQ) for several reasons against the state agency, including: criminal actions and negligence harming and killing Flint residents; failure to protect public health from water, air and soil contamination; faulty scientific protocols and responsibility to uphold standards and policy requirements against pollution and environmental degradation; culpability in allowing for unjust and harmful natural resource privatization, commodification, fracking, pipelines, extractions, toxic spills, water shut-offs and rate increases; failure to uphold its EPA responsibilities; human rights violations and more. Pre-trial Court Conference: 1:30 pm on Tue, 1/15/19 at Lansing 54 A District Court, 124 W Michigan Ave # 54A, Lansing, MI 48933. Located inside Lansing City Hall (across from Michigan Capitol buildings). More details: Last summer, approximately one-third of the MDEQ arrestees chose to settle quickly their case with the Ingham County prosecutor's office through guilty or no contest pleas and/or by participating in a diversion program to remove a misdemeanor charge from their record. The remainder of the group had been waiting for the announcement of arrest warrants to appear before the court. They were finally issued in late December. On December 28th several MDEQ arrestees traveled to Lansing 54 A District Court to appear on their warrants and pay bonds. Among the outcomes were: (1) Those charged with “trespassing” appeared before a magistrate; (2) Those charged with “disturbing the peace” appeared before a judge; All were fined and paid $150 thus fulfilling all that is required of them, plus they will have a misdemeanor on their record; (3) A third group pleaded “not guilty” and requested a jury trial. At this time, a handful of warrants are still outstanding for a few people who have been unable to get to Lansing and/or are out-of-town. We take seriously the concerns our attorneys have raised for these warrants to lead to re-arrest so future appearances is being coordinated. Also, please save the date for more MI PPC 40 Days of Action court proceedings in Detroit beginning January 23 at 1:30 pm at 36th District Court for the #Gilbert7 group arrested on June 18th against gentrification, low income housing evictions, corporate profits on the back of poor residents, real Detroit corporate dystopia and more. Additional updates on the entire list of arrests during the 40 Days of Action can be found on the Michigan PPC website. Finally, National Lawyers Guild (NLG) attorneys who have been working on these cases pro bono tell us that their resources to support trial work are depleted. 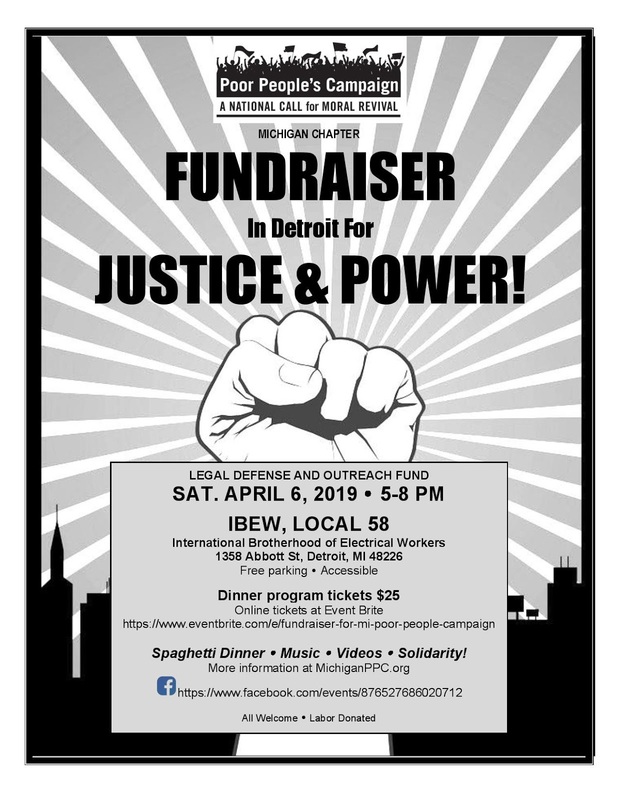 They are requesting that MI PPC defendants consider raising funds to support unpaid and underpaid attorneys so that they may continue representing us through low bono arrangements. We deeply appreciate NLG work and sacrifices and will follow up with more on this soon. We will share more updates, news and National PPC 2019 campaign actions and moral positions in the coming days. Mark your calendars and join us to support those arrested in Lansing on June 4, 2018! Tuesday, January 15, 2019 MI PPC members will be in Lansing District Court 54-A. Those risking arrest blocked the doors to the North, South, East and West building entrances. At each side side of the building, we named the crimes. To the North- the M5 Pipeline. To the West- Nestle’s pumping of water. To the South- the Detroit water shut offs. To the East- the poisoning of Flint’s water. At 5 pm on June 4th, PPC members risking arrest moved to block the parking lot and were immediately arrested. 30 people were arrested. CONSEQUENCES: Eight PPC members have accepted a Diversion Program offered by the District Court. 14 of those arrested plan on taking this to a jury trial. On Tuesday, January 15th, those seeking a jury trial are scheduled to appear for pretrial hearings at 1:30 p.m. MI PPC supporters and members are encouraged to appear with us in court in either the morning, the afternoon, or both. Defendants are to appear in the courtroom of Judge Louise Alderson.